Armament: Four roll-off racks for Mark XIII 22.5-inch diameter torpedoes; one 40mm gun; one 37mm gun; one 20mm gun; two .50 caliber machine guns; 2-4 depth charges; smoke generator; two Mark 50 5-inch rocket launchers. PT-617 was assigned to Patrol Torpedo Squadron 42, the only squadron commissioned after World War II. PT 617 participated in the Victory Loan Bond Drive in October and November 1945. After being sold on the civilian market, the boat was used as a yacht, in salvage and as a diving platform. 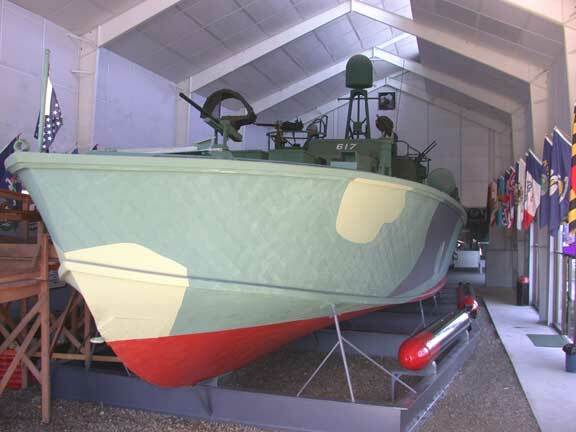 PT Boats, Inc., a worldwide organization of PT veterans and others, bought the boat in 1979. Considerable work and funds went into restoring PT 617 to WWII configuration. On September 1, 1985, PT-617 officially went on display at Battleship Cove. Of the three manufacturers of these versatile and highly maneuverable craft, Elco produced the largest number for the U.S. Navy. PT boats operated in the English Channel, the Mediterranean, the Caribbean, the Aleutians, off the Eastern Seaboard, and throughout the Pacific. They saw major action in the Normandy invasion, the Solomon Islands, New Guinea and the Philippines. PTs performed a multitude of duties, including transporting dignitaries -- the most famous of whom was General MacArthur, both when he left Corregidor and when he returned. They also carried mail, rescued downed pilots, dropped and picked up spies, terrorized Japanese supply lines and harassed German E-boats. PT-617, PT-796, and the National PT Museum on board Battleship Massachusetts represent the world's largest collection of PT artifacts and memorabilia. The world's only restored pair of PT Boats, PT-617 and PT-796, are two of five National Historic Landmarks on exhibit at Battleship Cove, the world's largest collection of historic naval ships. PT-617 is owned by PT Boats, Inc., headquartered in Germantown, Tennessee. PT-613, sister of PT-617, exemplifies characteristic lines of the 80 foot Elco.